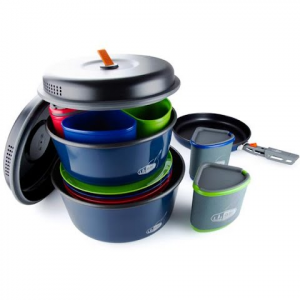 @ A versatile addition to your kitchen, the Multi-Pot can be used three different ways. 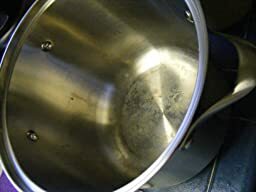 Use it with the pasta insert to cook and then drain pasta or potatoes; use the steaming basket for vegetables or fish; or use the generously-sized stock pot alone when preparing soups, stocks or chili. Bring stunning, contemporary design to your kitchen with Calphalon Contemporary Stainless cookware. Crafted from lustrous, brushed stainless steel, clean lines and curvaceous silhouettes, Contemporary Stainless epitomizes the soul of modern style with professional performance and dishwasher-safe convenience.  What is your opinion of Calphalon Contemporary Stainless Steel Cookware, Multi-Pot, 8-quart? We would like you to leave a comment below. * Check out these new styles and more from Zappos.com! 1. It stains like crazy inside and the stains don’t come out through a normal hand-washing process (with Dawn soap and normal kitchen sponge – these are cleaning directions that Calphalon gives in their warranty leaflet.) I MUST say I only used this pot 3 times so far: once making chili, once boiling pasta and once steaming. Even the inserts are starting to stain after such little use… I am worried about what will happen to it in time. 2. 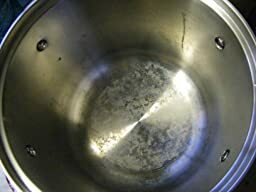 It sometimes gives off a faint funny smell, metal-like, as if it wouldn’t be stainless (especially the parts with wholes in them, when wet – almost like that awful smell that cheap metal jewelry has). I believe it might be a low quality stainless steel layer on the inside… or maybe the rivets, no idea. How does it not react with the food, I wonder? 3. tri-ply or not try ply? 🙂 Some customers complained about the product description being misleading since it makes you think that the whole pot is try-ply (as the others in the try-ply “Contemporary Collection”). So, what I notice is that the base is definitely try ply but it is attached to the bottom of the pot so it is not a continuous tri-ply construction (but rather a tri-ply encapsulated bottom construction). I wanted a tri-ply but didn’t really understand what it meant at the time. So the fancy cookware that has uninterrupted try-ply construction would be extremely heavy in an 8 qt pot and a little bit more expensive. But it’s not incorrect to call this tri-ply since in actuality it is just that: a try ply base with an aluminum core wrapped in stainless steel attached, in turn, to stainless steel walls… It is tri-ply at the bottom and stainless on the side. Good enough for steaming, boiling pasta, and simmering stews and soups without burning. I personally don’t think it’s justified to invest into the performance of all-over tri-ply for these purposes – if only this was good quality steel. 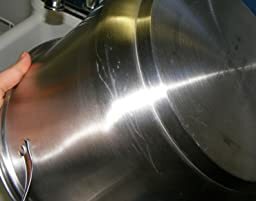 The covered pot reaches a rolling boil in a 20 minutes with water to the level of the handle rivets. I don’t think a continuous tri-ply is much faster for this amount of water and this diameter base. 4. 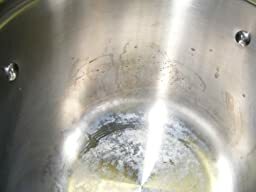 During cooking, the glass cover makes some funny popping/crackling sounds every now and then- almost like the glass cracks – and I have never experienced that with glass lids before. I tried tapping on it gently with a spoon to check if it was about to shatter, but nothing happened. 😐 Still, that popping is a little scary. a. I love, LOVE the looks. the design is awesome… so sleek, so contemporary.. it’s a pity that the quality doesn’t raise up to that level also. b. The 3 parts and lid nest perfectly. Again, great design. c. bottom heats evenly and doesn’t burn food (as in simmering chili for many hours in med heat – nothing stuck to the bottom). d. Pasta insert has small dents on the bottom (so it’s not perfectly flat) that allows you to set it in the sink for the water to drain without the whole bottom making contact with the sink. It feels cleaner this way since the noodles that rest in/hang from the holes won’t get contaminated from the sink. I will attach pictures. The pot was washed thoroughly and air dried for many hours prior to taking the pictures. 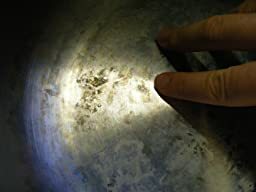 There was no physical residue on the bottom of the pan – it felt absolutely smooth to the touch. I’m not sure if I will return or not… I might test it some more. I’m just really disappointed with how it looks inside after only 3 uses. I have returned this pot. I continued cooking with it and the staining just got worse and worse. My conclusion is, they didn’t use 18/10 steel in this pot. 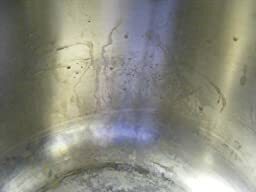 It is probably some cheaper version of stainless steel that stains more easily. I also couldn’t stand the rusty smell that it had, every single time I would take the lid off, to start using it. What a pity! Instead, I bought the $50 Tramontina multi-pot from The grocery store and it didn’t stain nearly as bad. That one is 18/10 since it says so on the label. I am much happier with this “cheaper” pot. I hate the hassle that Calphalon caused me. 2. Have an easy (or easier) way to make my usual dozen hard boiled eggs each week. That should be easy right? Well…it’s not so easy as I have found out. I’m no culinary expert, so I didn’t even know the correct search term for what I was looking for. But eventually, I stumbled on multi pots. I found numerous multi pots on Amazon and as I started reading reviews, I found that it was fairly common place to see, “Pasta insert too shallow”. In fact, there is another Calphalon multi pot that had those exact words in some of the reviews. I quickly understood the problem with a pasta insert that didn’t go down far enough. And if you are here, you are likely of the same mentality. But each time I found a multi pot that was within my price range, it was pretty vague as to how far down the pasta insert went. It never seems to be defined in the item description. AND, just about every photo I’ve seen, seems to partially hide the true depth of the insert….as if it’s being intentionally concealed so it doesn’t scare you away. 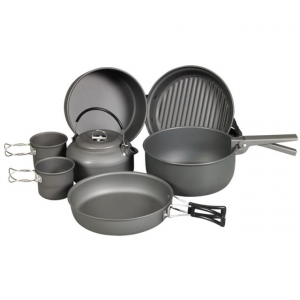 When I found this Calphalon version of the multi pot, I saw fewer reviews, no one was complaining of depth issues, and the photo ALMOST looked like the insert had more depth than the rest in this price range. So by this time I figured the heck with it, I’ll order it and see what I get. And when I opened the box…..Behold, the insert had the depth I was hoping for…I measured is at 1.5 inches off the bottom. I have yet to try it out…as in make a batch of spaghetti or eggs. But since there are so many inserts out there that are “too shallow”, I’m beginning to wonder if it’s actually a functional issue. In other words, if the insert goes down too far, will you get a good boiling action or circulation in the pasta compartment. That remains to be seen in my case. As for my dozen egg requirement, I don’t see where that would be an issue. Again, I’m no chef. I’m more of a weekend warrior in the kitchen. I don’t know jack about cookware…well maybe a little. But this pot seems very well made. I know that doesn’t mean much coming from a bachelor who eats spaghetti 3 times a week. But compared to the junk I just threw away, this is a high quality pot. You may not agree but let’s look at my needs and point of reference. There is a nice glass lid and a steamer which I will likely use. All seem to be very well made. Even when I lift the pot, it’s not overly heavy, but it is a very substantial piece of metal. Anyway…In case there is someone out there wildly trying to find an insert that goes ‘down far enough’, look no more…this is the pot for you. I thought that being Calphalon and costing $93, I would get a quality product. Not even close! The two perforated containers that sit inside are tinny and both stained after the very first use. They are discolored and look terrible. While the pot and lid seemed to be of good quality, the pot did not hold up past the second use. It has stains inside from where the water level was even after I scrubbed it with cleanser. 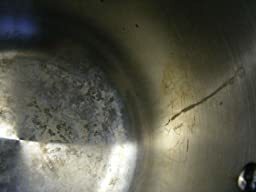 There are also white spots on the bottom of the pan that look like calcification, but can’t be scrubbed off; they may even be corrosion in the pot itself considering how hard I’ve tried to get them off. Then to top it all off….after about four uses cooking artichokes, the entire inside of the pot is tinted green. Also, in case anyone is wondering, I’ve never let the water boil down very far and have been very careful with how I care for the pot. The only good thing is that it is a nice looking pot from the outside.